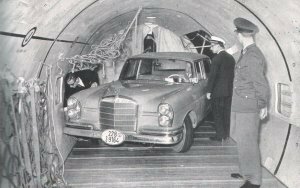 (1) how a Mercedes 220S gets from Stuttgart to New York in 14 hours ? (2) that a 190D took place in an economy test ? (3) that the Fintails won quite some rallys in their time? Part 1. 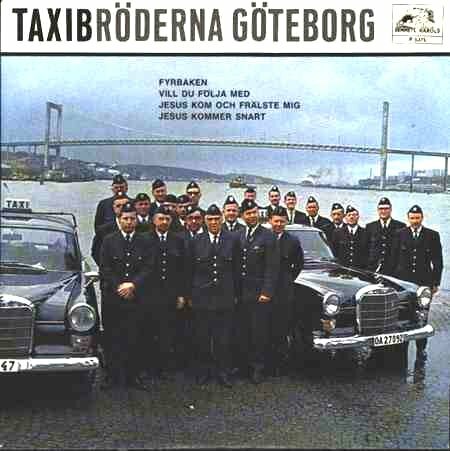 (4) that the Heckflosse even appeared on a record sleeve ? (1) With 600 kilometers per hour across the Atlantic Ocean. Just a few moments ago the menu was the main attraction and the waiter recomended the Moselle wine. Now every guest in the restaurant of Stuttgarts airport Echterdingen are looking with great tension to the dusky runway where lights flash. Is it the Fire departement who is holding a fire-drill? All attention is focused at a very unusual sight. 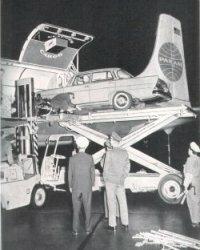 Nothing less than a whole car is being loaded into the belly shaped hull of a large traffic airplane. Since when is this common practice? At least since large air line companies have adapted themselves to the special wishes of their clients. More and more requests are being made to ship heavy and large objects via air. To meet this need, passenger airplanes are being coverted into flying furniture vans. These giant birds of the type DC-7 F (the F stands for freight), which are flying for the Pan American World Airways are 34,5 meter long. With their 4 engines they develope 13.600 horsepower and the tanks hold some 30.000 liter petrol. It is no wonder that such a plane with 12.500 kilogramms freight can develope a speed of 600 km/h in the air. The Mercedes-Benz 220S ordered by an American vice president of the P.A.A. is sitting on a specialy developed loading-bridge. The car is being raised very carefully to the level of the plane and then pushed into the airplane. The journey can begin after the car is carefully strapted to the metal hull. Just 14 hours after take-off from Stuttgart in Germany the car lands in New York and can begin its live on the American roads. There are no statistics avialable yet for this kind of transport but the 20th century has giving us many unforeseen pleasures. (2) 4,043 miles Trans-Europe 190D Economy Test. Berlin was the start, Paris the finish. The distance in-between amounted to 4,043 miles (6.468 km), along which the well-known American journalist Bill Carroll conducted an economy test in a Mercedes-Benz diesel passenger car. 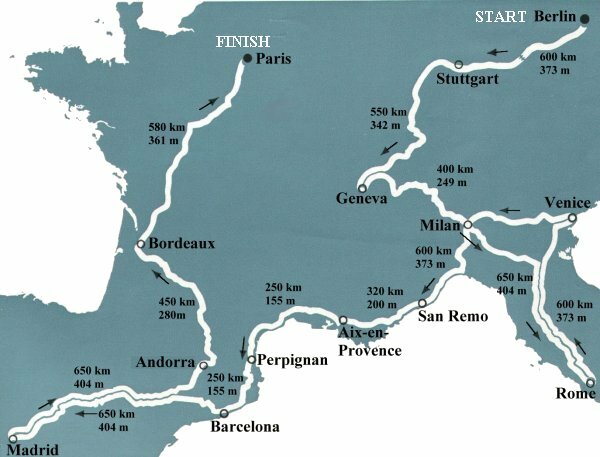 Following the successful conclusion of the run, but also at the intermediate stops in Stuttgart, Geneva, Milan, Rome, Venice, Nice Barcelona, Saragossa, Madrid, Andorra - the international press celebrated the enterprise as a "Triumph of a matured automobile". Mr. Caroll has proven - and the large number of American tourists who pick up their cars each year at the Sindelfingen plant of the Daimler-Benz AG will no doubt acknowledge - that there is hardly a more pleasant, nor a more economic possibility of going on an extended holiday trip. When we talked to the likable journalist and his charming wife at the end of his trip in Paris, Bill Caroll emphasized that he owes his travel impressions mainly to "traveling in his vehicle". "Well", he said, "we Americans, and believe me I can say the same more or less about all tourists, are today no longer concerned to arrive at our holiday goal as quickly as possible. After all, holidays begin when you start your trip and in my opinion you can simply never learn enough about a foreign country. This is why I consider traveling in one's own car the best method to gain new impressions mile fo rmile. And the ideal vehicle for such a purpose is the 190D, since you hardly travel at lower costs and simultaneously at similar comfort with any other means of transportation." At the end of the trip 50 leading representatives of the French dailies and the trade press met in the exclusive Paris restaurant "Le Doyen" for an oppurtunity of discussing all the details of this Trans-Europe Economy Test. Following the introductory words of Monsieur Ch. Delecroix, the Mercedes-Benz general distrubitor for France, Departement Director Heinrich Will, Head of the Sales Range North America, referred in the name of the Daimler-Benz AG a.o. to the advantages obtained by American tourists when buying a Mercedes-Benz vehicle in Germany, a fact again proven by the economy run of Mr. Caroll. He stressed the fact that by picking up their Mercedes-Benz diesel passenger car in Europe Amercian tourists would make savings which then could be used for paying a part of their hotel and travelling costs. In closing he referred to the also successfully competition between a Mercedes-Benz 190D and the French express train running on schedule between Paris and Nice, organized by the Mercedes-Benz general distrubitor. He called the event worthy of the fact that with a Mercedes-Benz diesel vehicle you are not only traveling faster, but also cheaper than with an express train. It was a happy coincidence that the two events could be celebrated in "Le Doyen" in the French capital city. And both the French press and the public showed their appreciation by displaying their pertinent interest. Everybody was very much aware of the fact that none of the vehicles has been equipped with any special technical equipment and that they were in fact vehicles "the way they are bought by the customers". Mr. Carroll proved on his 4,043 miles that with the 190D Mercedes-Benz drivers are in command of a vehicle which uses only 6,85 liters diesel fuel for each 100km (35 miles per US gallon) on the entire route. "That", Bill Carroll said, "is absolutely unique for a vehicle in this class, more so since during the ride Alpine passes, normal highways and unmetaled roads had to be covered." 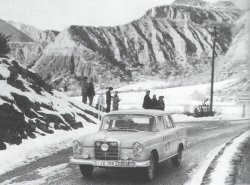 The journey was Mr. Carroll's third trip with a Mercedes-Benz vehicle within 6 years. "But", he said in closing. "It was also the most impressive one and the most thrilling. Automobile tourism of today in its most beautiful aspects." 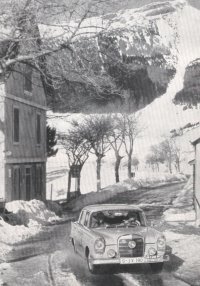 (3) The Monte Carlo Rally, 1960. Something to remember, one year after the sedan was officially introduced it entered the Monte Carlo Rally in 1960. The result was that first, second and third place were won by these cars! First price went to the team of Walter Schock (left) and Rolf Moll (right) in their Fintail with the famous number 128. The winning team Schock/Moll lost only 30 secs on the Mountain Circuit, while second- placed Eugen B�hringer and Hermann Socher lost just 1 min.  and 48 secs. The highest-placed non-Mercedes entry was Peter Harper's Sunbeam Rapier which lost nearly 11 min. Third overall was the works partnership of Eberhard Mahle and Herbert Ott. This European Rally with its length of 3650 kilometres is often called the "King of Rallys". It is also often compared with the roulette game, not because the winners and loosers meet each other at the roulette tables in the casinos (they were probably too tired to do so) but because the rally itself looks like a roulette game. Snowstorms, ice or even an avalanche can destroy a chance of winning, nature behaves much like the little ball in the roulette game. The contestants had the choice to start in Athens, Oslo, Warschau, Lissbon, Glasgow, Paris, Frankfurt, The Hague or Rome. Schock/Moll choose the Polish capital city of Warschau to start from. Of all contestants, only 48% made the finish. By winning the first three prizes, Daimler-Benz also won the Manufacturers team prize. (4) The Heckflosse on a record sleeve. Send in by Tomas Stanislawski from Sweden. Here comes a little oddity, a Swedish record sleeve with two fintails (late model 190c or 200).